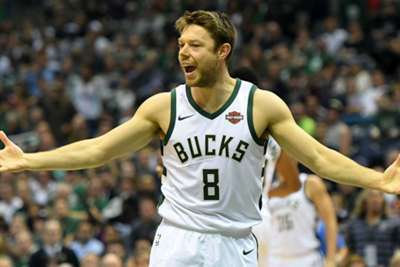 The Cleveland Cavaliers were outclassed by the Milwaukee Bucks on Friday, but Matthew Dellavedova ensured there was some entertainment for the home fans. The Cavs star, who played 27 minutes off the bench in the 114-102 defeat, brought the Quicken Loans Arena crowd to its feet as he crashed through the media table in pursuit of a bouncing ball. With the ball heading out of play, Dellavedova scooped it back onto the floor but his momentum took him straight into the assembled media, landing next to NBA commentator Fred McLeod, who was knocked out of his seat. Asked if he had escaped without injury, Dellavedova joked afterwards: "My left shoulder's a little sore after going into Fred's rock-hard abs." And Cleveland coach Larry Drew was left feeling apologetic after he backed out of the way of the onrushing player, putting McLeod in the firing line. "I feel kinda bad because I moved out of the way," said the smiling coach. "But I know he was trying to save the ball. That's who he is. That's why he's in this league, because he's still making plays like that."